Other apps, especially firefox and thunderbird, don't respect this setting. They respect fontconfig though - so one has to configure both. Firefox and thunderbird might update their rendering after fontconfig has rescanned the configuration. This might happen, but to be sure, better restart them. 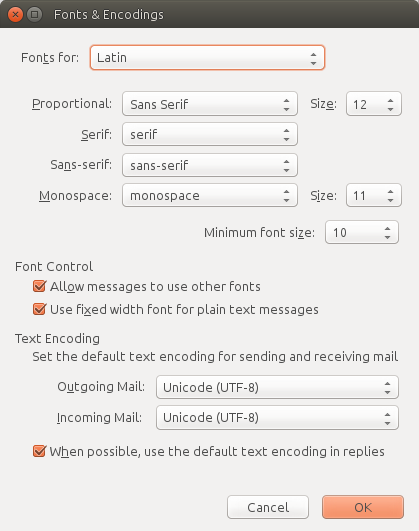 Firefox and thunderbird have font settings for each encoding. 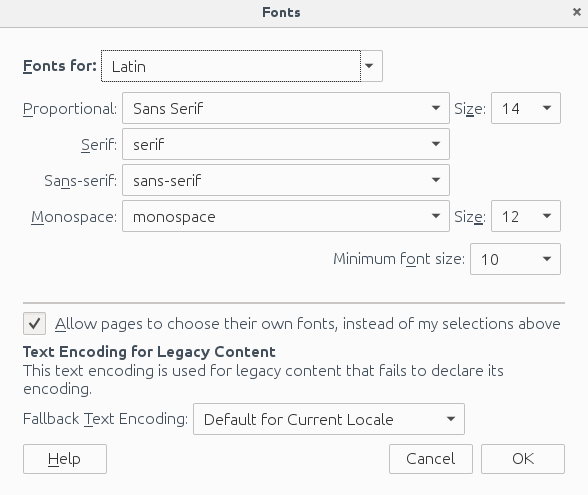 So one has to set proper values for 'latin' and 'other writing systems' which is their acronym for utf-8. I like my fonts to be crisp, like in the screenshots below, and I don't care too much about the actual font shape. I don't use MacOS (or whatever OSX is called these days) :-). Before configuring fontconfig one has to understand the problem of Helvetica. Lots of websites want it, but Ubuntu delivers a really unsuitable replacement. Thats why lots of websites look ugly, unless a better alternative is configured. I like to use Arial as a replacement, but DejaVu Sans would do as well. Update: I use 16 now instead of 14. Last there are the qt based apps. like skype, where the font is a bit to small for me. So I used qtconfig from qt4-qtconfig, changed appearance to another style, saved, changed back to Desktop Settings (Default), saved again. and now it looks good.